Could Illinois suddenly be emerging as a hotbed for PGA Tour players? That seems unlikely, but look what happened in the first few weeks of the PGA Tour and Senior PGA Tour seasons. Mark Wilson, an Elmhurst resident, won the Sony Open in Hawaii in the PGA Tour’s first full-field tournament of 2011, then captured the Waste Management Phoenix Open in his third start. Wilson, who wanted to keep playing, ran out of gas in his next tournament — the AT&T Pebble Beach Pro-Am. Still, no problem. D.A. Points, raised in Pekin and a collegiate star at the University of Illinois, won his first PGA Tour event at Pebble Beach. Not only did he win the pro event, he teamed with comedian Bill Murray, who grew up in Wilmette, to capture the pro-am division. And then there was Jeff Sluman. The long-time Burr Ridge resident was at the top of the leaderboard in the Champions Tour’s Allianz Championship in Boca Raton, Fla., until Tom Lehman rolled in a birdie putt on the final green. Sluman wound up as the runner-up on the same day that Points and Murray celebrated their victories. When the dust had cleared Wilson, off his two victories, and Points stood one-two in the FedEx Cup standings, making them — at the moment — the front-runners for the $10 million bonus that’ll be paid out after the PGA Tour’s playoff series concludes in October. Wilson shot three 72s and missed the cut at Pebble Beach, but he’ll likely be heard from again. He committed to the eight tournaments that immediately followed his win at Phoenix. And both he and Points qualified for their first Masters appearance in April. So, chances of both being heard from again soon appear good. Wilson, 36, earned his first berth in April’s Masters with his victory in Hawaii and his second win got him into the World Match Play Championship as well as a World Golf Championship stop at Doral in Miami. Getting into those big money events drastically changed Wilson’s schedule..
“I’ll play through Bay Hill, then take the week off before the Masters,” he said. Two of the other stops before the Masters are the Honda Classic, which Wilson won in 2007, and the Mayakoba Classic, which he won in 2009. Those were Wilson’s only PGA Tour wins prior to his explosion in the last three weeks. Wilson grew up in Menominee Falls, Wis., and is an avid Packers’ fan. But he and his wife Amy settled in the Chicago area several years ago. The couple and their two young children, Lane and Cole, are enjoying life on the road now but when he’s not on tour he practices regularly at Cog Hill in Lemont. Both of Wilson’s recent wins came in tournaments with schedule difficulties. He needed to play 36 holes on the final day in Hawaii and frost delays created a rare Monday finish in Phoenix. Because of the frost he played four holes on Thursday, 28 on Friday, four on Saturday, 30 on Sunday and six (two in the playoff) on Monday. A nine-foot birdie putt enabled Wilson to finish off Dufner, a champion in Chicago in 2006 when he won the Nationwide Tour’s LaSalle Bank Open at The Glen Club. The win hoisted Wilson’s world ranking from 91 to 51. He ended last season as No. 230. The Packers’ run to the Super Bowl was a distraction during his win at Phoenix. “The saddest thing was that I couldn’t watch the first half,” said Wilson, who played until dark on Sunday. Still, he had a green and gold visor made up especially for Super Bowl week and also wore a “Cheese-head” hat during breaks between tournament rounds. Points, meanwhile, has deeper Illinois roots. The key to Points’ win came at the 14th hole of the final round, when he holed a 107-yard gap wedge for eagle. Playing with the always-clowning Murray was no problem. GLEN ELLYN, IL. — The Illinois State Amateur seems to be turning into the Iowa Invitational. At least over the last two year’s the big event for Illinois players ended up as a showcase for the University of Iowa’s golf program. In 2010 Deerfield’s Vince India was a seven-shot winner of the State Am at Beverly Country Club. A year later two of his college teammates, Brad Hopfinger of Lake Forest and Chris Brant of Edwardsville, finished one-two in the 81st Illinois State Amateur at Glen Oak in Glen Ellyn. “That says a lot about the team we had there,” said Hopfinger, who got around the 6,741-yard Glen Oak layout in 12-under-par 272. Brant was four strokes back and no one else was under par, in part because of the unfortunate disqualification of perennial contender Todd Mitchell of Bloomington. Leading through 36 holes, Mitchell finished third but then signed an incorrect scorecard. Hopfinger, his playing partner in the final twosome of the last two rounds, put him down for a four on the fifth hole of the final round when Mitchell instead made a five. Mitchell, who left the premises without commenting, had won the State Am twice and never finished worse than eighth in his previous nine starts. Mitchell’s misfortune didn’t detract from a great final day for Hopfinger, who took the lead with a blistering 64 in the third round and never trailed.He made eight birdies in the morning round of the 36-hole finale, three of them coming on the final three holes. He never trailed after that en route to claiming the Louis T. Emmerson Trophy. Brant, playing one group in front of Hopfinger, got within one stroke after 10 holes of the final round but his chances at winning ended when his 3-iron tee shot at the 225-yard par-3 16th sailed far right into thick rough, leading to a double bogey. India and Hopfinger both used their fathers as caddies in their runs to the title. India couldn’t defend his crown. The Big Ten player-of-the-year for 2011 was named to the U.S. team for the World University Games, so he spent the week competing in China. “I wish he’d been here,” said Brant, who will enter his senior year at Iowa this fall while India and Hopfinger are moving on. India, Hopfinger and Brant played in the 1-2-3 positions for an Iowa team that finished 10th in the NCAA finals. For Hopfinger, 22, the State Am was a great ending to his amateur career. Having failed to qualify for the U.S. Amateur, he entered the pro ranks slightly ahead of schedule. Three days after his big win at Glen Oak he was off to Lawrence, Kansas, and a Monday qualifier for a Nationwide Tour event. “It meant a lot to get a win,” said Hopfinger, who got around par-71 Glen Oak in 71-68-64-69. A week earlier Hopfinger made a solid showing in the Western Amateur at North Shore Country Club. He got through all 72 holes of the rugged stroke play qualifying there but didn’t make it to match play. He was better in the State Am despite a slow start in the opening round, when wet conditions required the lift, clean and place rule to be put into effect. The 7-under 64 in the third 18 was Hopfinger’s low career competitive round. It was one stroke off the course mark set by Danny Mulhearn, who is in his eighth year as the club’s head professional. Next year’s State Am at Kokopelli in downstate Marion represents a chance for an Iowa three-peat. Brant would be a strong contender if he has a solid senior season for the Hawkeyes. Though it’s a year away, the next step after that seemed obvious — following Hopfinger into the pro ranks. HAWTHORN WOODS, IL. — Wilmette’s Philip Arouca hadn’t done much in professional golf — until he teed off in the 62nd Illinois Open at Hawthorn Woods Country Club. Then he couldn’t do much of anything wrong. Arouca, 26, opened 65-67 in the 54-hole tournament, then held off a challenge by Libertyville’s Michael Schachner to take a three-stroke win and claim the $15,500 first prize. Arouca posted an 11-under-par 202 and became the second New Trier High School graduate in a row to win the championship. Eric Mierdierks missed the cut in his title defense.. Though he blew a six-stroke lead in the final round, Arouca never trailed in his fourth appearance in the tourney. He had missed the cut in his previous two tries at Hawthorn Woods and appeared to be folding when his tee shot at the 12th hole sailed out of bounds. The OB shot created a three-shot swing and lifted Schachner into a tie for the lead, but Arouca reclaimed the top spot with a four-foot birdie on the next hole and led by himself the rest of the way. Doug Ghim, 15, of Arlington Heights became the youngest player to ever compete in the championship. He finished at 7-over-par 220 and tied for 37th. John Seehausen, 67, of Inverness was the oldest player among the 156 starters. He was medalist in a qualifying tournament at Inverness after shooting a 69 on his home course. He showed that was no fluke by also posting 69 in the first round at Hawthorn Woods before finishing 78-80. Mike Small, the University of Illinois coach, was hoping to win the tournament for the fifth time and tie Gary Pinns for most Illinois Open titles. Small, who last won the Illinois Open in 2007, finished in a tie for 13th at 1-over 214. ROMEOVILLE, IL. — Wheaton’s Jenna Pearson became the first golfer to win the Phil Kosin Illinois Women’s Open as both an amateur and a professional when she captured the 17th staging of the event at Mistwood in Romeoville. Pearson, in her fourth year as a touring pro after a solid collegiate career at South Carolina, posted the low score of the final round, a 68, to finish at 1-under-par 215 for the 54 holes — two strokes better than Sterling amateur Ember Schuldt, a University of Illinois golfer. Since turning pro Pearson has played on both the Duramed Futures and Canadian tours. She has also finished in the IWO’s top 10 each of the last five years. She won the tournament for the first time as an amateur in 2006 and was low pro the following year, when her title defense was spoiled by a loss to Libertyville amateur Nicole Schachner in a 10-hole playoff. As was the case in her previous IWO appearances, Pearson had her mother Laura as her caddie. Leaderboards being scarce at the IWO, they were surprised to find Jenna in a tie for the lead after the 15th hole of the final round. Pearson did just that. She hit a 6-iron at the 152-yard 17th hole to four feet from the cup. Then, after a long talk with her mother, she rolled in the birdie putt to take sole possession of the lead. There was more mother-daughter debate on the par-5 18th after Pearson put her drive in the right rough. She was tempted to go for the green from 190 yards out, but her mother thought better of it. In this case mother knew best. So, Pearson played her second short of a creek fronting the green, then chipped to within a foot of the cup. “Definitely the kind of birdie putt I wanted,” she said. It dropped, giving Pearson the biggest first-place check in IWO history — $5,000 from a $17,000 purse. Western Amateur: A Peek At The Future? Now it’s North Shore’s turn. The Western Golf Assn. is now in the third year of its new policy of playing its Western Amateur championship at Chicago courses. 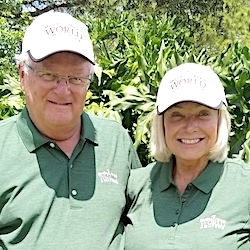 After a 28-year run at Michigan’s Point O’ Woods the WGA took the Western Am to Conway Farms, in Lake Forest , in 2009 and Skokie, in Glencoe, in 2010. History-wise, North Shore — which will host the tourney from Aug. 1-6 — is very much similar to Skokie. Both hosted long-ago U.S. Opens, Skokie in 1922 when Gene Sarazen was the champion and North Shore in 1933 when Johnny Goodman became the last amateur to win that coveted title. North Shore also hosted the 1928 Western Open (a brothers’ duel in which Abe Espinosa beat Al) and the U.S. Amateurs of 1939 (won by Marvin “Bud” Ward) and 1983 (won by Jay Sigel). Like Skokie, North Shore underwent a renovation long after the respected British firm of Colt, MacKenzie and Allison did the original design work for the course’s opening in 1924. Rick Jacobson, the Libertyville architect who caddied at North Shore in the 1970s, played the pivotal role in the club’s Strategic Presentation Plan that began in 1994. The change in venue doesn’t mean much to defending champion David Chung, a Stanford University senior from Fayetteville, N.C.
Well said, but Chung is a different player this time around. He’s more seasoned, for one thing. After his win at Skokie Chung went all the way to the final of the U.S. Amateur before losing to Peter Uihlien. The runner-up showing got Chung into the Masters, but he didn’t survive the 36-hole cut. He did, however, post a scorching round on his school’s home course later on, tying the Stanford course record with a 61. But, though, he’s more battle-tested, Chung isn’t swinging the same — on purpose. Despite his success over the last two seasons he decided to undergo a swing change in an effort to better prepare him for the PGA Tour. Regardless of how he’s swinging, Chung will have to be at his best to win the title again. As usual, the Western field is loaded — and this one may be even more so than most years. The early entries include No. 1-ranked amateur Uihlein, Kent State’s John Hahn who won the Western Am at Conway Farms and Patrick Rodgers, Chung’s freshman teammate. Rodgers won the Western Junior last year and could defend that title since he would still be 19 by tournament time. Rodgers, though, opted to skip his title defense to play at North Shore. Geography-wise that’s not a big difference for Rodgers. For the first time since 1928 the WGA is playing all three of its championships in the Chicago area, so he’d be coming to Chicago anyway. The Junior will be played at Beverly and the PGA Tour’s BMW Championship returns to Cog Hill. Also teeing it up at North Shore will be Russell Henley, a University of Georgia golfer who won the Stadion Classic on the Nationwide Tour this year, and Scott Langley, the 2010 NCAA champion for Illinois. For some local flavor there’s Vince India, the Illinois Amateur champion from Deerfield and Big Ten player-of-the-year for Iowa. Frequently dubbed “the Masters of amateur golf,” the Western Am is a grueling test. It begins with the entire field playing two rounds of stroke play competition, then the low 44 and ties go 36 more on Day 3 to decide the 16 qualifiers for the match play portion of the tournament. The Western’s “Sweet 16” have included some great talents over the years. Twenty-nine of the last 35 PGA Tour players-of-the-year were “Sweet 16” qualifiers. So were 12 of the top 20 on the PGA’s career money list. Twenty-eight went on to win major championships. The very select batch that went on to win Western Am titles include Jack Nicklaus, Tiger Woods, Ben Crenshaw, Justin Leonard, Phil Mickelson, Curtis Strange, Hal Sutton, Lanny Watkins and Tom Weiskopf. MEDINAH, IL. — The 92nd Chicago District Amateur took an unusual twist. The championship match was played on a different course than all of the preliminary competition, but no one was complaining. Medinah Country Club played host to the tournament, and the 36-hole stroke play qualifying competition was to be played on its Nos. 1 and 2 courses. The match play portion, to determine the champion, was scheduled for just the No. 1 layout, with the club planning to keep the famed No. 3 course rested for the 2012 staging of the Ryder Cup matches. After the stroke play qualifying for the 47 finalists, however, Medinah officials offered No. 3 for the final match. That layout had undergone another major renovation since hosting the 2006 PGA Championship in preparation for the Ryder Cup. Scully thought the chance to play No. 3 would be “an incentive” for the 16 players left in the tournament, and he was right. Though neither of the finalists had ever played the No. 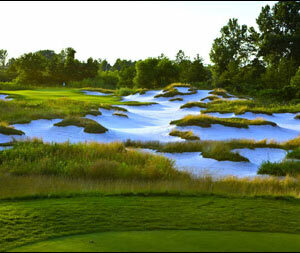 3 course, both welcomed the change in venue for their 36-hole showdown in the oldest amateur tournament in the Midwest. Runner-up Andy Mickelson, from Lockport, agreed. English, 20 and a junior at Florida Gulf Coast University, and Mickelson, 29 and the merchandise manager for a Lisle packaging company, waged one of the most competitive finals in the tourney’s rich history. English, 2-down with four holes to play, fought back to force extra holes and then won it with a par when the players played the course’s No. 1 hole for the third time. That hole wasn’t friendly for Mickelson. He put all three of his approaches in the same front bunker, making bogey on the first and third attempts at the 383-yard par-4. The second was telltale. Instead, Mickelson ran his bunker shot five feet past the cup and missed the par-saver. English two-putted for par from 15 feet and the 8 hours 42 minutes of competition were over. A month earlier Mickelson and English were in a duel for the Joliet Amateur title. Mickelson did that until the very end. English was 2-up after three holes, but Mickelson won three times between holes 4-7 to take the lead. He was 2-up after another good stretch in the afternoon round before English mounted his comeback. He was 1-down after making birdie at No. 16 and a par on 18 was good enough to win that hole after Mickelson slipped on a 6-iron approach, leaving him a 90-yard third shot on the par-4. English was left 70 yard for his third after his drive found a bunker, but he saved par from five feet after Mickelson missed from six. The switch in courses worked against Mickelson, who made 11 birdies in winning his quarterfinal and semifinal matches the day before on the No. 1 course. Mickelson, who qualified fifth, eliminated medalist John Watson IV of Conway Farms 3 and 2 in the semifinals. Watson paced the 16 match play qualifiers with a 5-under-par 138 over the Nos. 1 and 2 courses. English, who plays out of Crestwicke Country Club and and tied for 11th in stroke play qualifying, eliminated No. 2 seed Casey Pine of Prairie Vista 2 and 1 in the semis. English’s three matches prior to the final all ended on the 17th hole. The four semifinalists qualified for the 81st Illinois Amateur, to be played at Glen Oak in Glen Ellyn from Aug. 9-11. OLYMPIA FIELDS, IL. — Ariya Jutanugarn was the easily the medalist at the 63rd U.S. Junior Girls Championship at Olympia Fields, but she was leery about getting into a match play situation with the title on the line. “I don’t like match play, because you don’t know when you’re going to lose,” the 15-year old from Bangkok, Thailand, said. This wasn’t her first time as a medalist, either. She also led stroke play at the U.S. Women’s Amateur Public Links Championship, but wasn’t as good in a match play situation there. As it turned out, during a week dominated by sweltering temperatures, Jutanugarn had little to worry about. She emerged as only the 16th medalist in the tourney’s 63 stagings to claim a victory, and it was her first U.S. Golf Assn. title. The heat — temperatures in the 90s — was an ongoing concern, but Jutanugarn was a cool customer throughout. She dominated the stroke play on Olympia’s par-72 South course, which was set up at 6,403 yards. Opening with a 68, she posted a 4-under 140 for her 36 holes — four strokes better than closest challenger Casie Cathrea of Livermore, Calif.
Then it was on to match play for the 64 survivors. Marissa Chow, of Honolulu, was Jutanugarn’s first match play opponent and won the first hole. That was just a wakeup call. Making six birdies in a nine-hole stretch, Jutanugarn eliminated Chow 6 and 4. En route to a battle with Dottie Ardina of the Philippines in the final Jutanugarn eliminated Sarah Schmelzel of Phoenix 4 and 3 in the second round, Gabriella Then of Rancho Cucamonga, Calif., 1-up in the quarterfinals and — in the most onesided match of the week — 14-year old Amy Lee of Brea, Calif., 8 and 6 in the semifinals. Ardina, 17, had a much tougher semifinal before ousting China’s Yu Liu 2-up. The 36-hole battle for the title was a nailbiter throughout. Neither player was better than 1-up until Jutanugarn rolled in a two-foot birdie putt on the 31st hole to go 2-up. Though she lost the 33rd hole to go back to 1-up, the end wasn’t far off. On the 35th hole Ardina three-putted, missing a three-footer for par, and Jutanugarn closed out the match with a four-footer for par and a 2 and 1 victory. “I’m disappointed because my putting dropped me down,” Ardina said. She hit 34 of 35 fairways and missed only three greens in the title match. When the week started the logical favorite was Katelyn Dambaugh, runner-up to Doris Chen in 2010. A high school junior from Goose Creek, S.C., who has already picked her college — the University of South Carolina, Dambaugh wasn’t fazed by the weather — “it’s a little hotter at home than this — and was much more comfortable with match play than Jutanugarn. Plus, Dambaugh had the experience of the previous year’s run to the title match. “It gave me a lot more confidence in myself. I had never been in a situation like that, and it was awesome,” Dambaugh said. She didn’t get beyond second round this time, losing 3 and 1 to Keel. Another former U.S. Junior Girls runner-up, Karen Chung (2008), made it to the quarterfinals before falling 6 and 5 to Liu. Neither Jutanugarn nor Dambaugh expected the heat to be a factor early in the week. Jutanugarn felt it was hotter in her native Thailand. Jutanugarn couldn’t get distracted anyway. Her sister Moriya, who served as her caddie only because a wrist injury forced her withdrawal from the tournament, kept her focused. The sisters didn’t always get along, either. After accepting the winner’s trophy Ariya thanked her parents Somboon and Narumon as well as her sister. “She’s so nice. She tells me, if she played in this tournament, she was going to beat me,” Ariya said. The Jutanugarns are no strangers to the U.S. They started spending summers in the U.S. in 2004 when the parents brought both girls came to a tournament in San Diego. This summer the girls were entered in 12 tournaments before returning to Thailand. The week before the Junior Girls both were in the U.S. Women’s Open at The Broadmoor in Colorado Springs. Ariya, who had won the American Junior Golf Association’s Rolex Girls Junior earlier in the summer, was one of five members of the Junior Girls’ field who competed at The Broadmoor. The Junior Girls, the 58th USGA championship staged in the Chicago area, had been held in the area only once previously — in 1951 at Onwentsia. That year the event had only 32 entries. 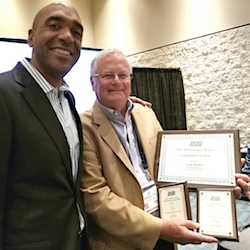 This year’s drew 1,084 that included players from 35 states and nine countries. BRANSON, Mo. 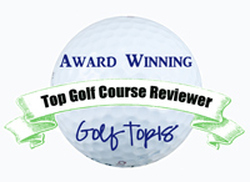 — The golf is quite good in this lively little town in the southwest corner of Missouri. 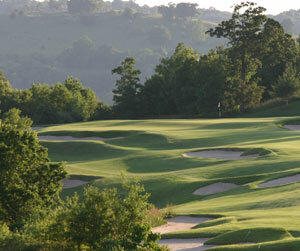 In just the last few years Branson, with about 6,000 full-time residents, has emerged as a golf destination. There are 13 courses in the general area, and they can accommodate all types of players. Eight of them — operating through the website golfbranson.com — encompass the super tough Murder Rock, credited to controversial PGA Tour player John Daly; Branson Creek, designed by the highly-respected architect Tom Fazio; the spiffy Payne Stewart Golf Club, built in honor of the late two-time U.S. Open champion and local resident who died in a plane crash; and LedgeStone, which may be the most beautiful of the lot with its sweeping views. You don’t have to be an accomplished player to enjoy golf in Branson, though. Most unique of the other layouts is the funky but fun Thousand Hills, a Bob Cupp design that features nine par-3s, eight par-4s and one par-5. I liked the Payne Stewart layout the best, but the best part of Branson as a golf destination isn’t necessarily the golf itself. It’s the other options. Rarely does any golf destination have the wide variety of other attractions that Branson offers. A golf die-hard doesn’t have to worry about keeping other family members, or less avid golfers in his travel party, from getting bored. There are tons of other things to keep them entertained. In its early years, Branson was mainly a gathering place for fishermen. Then Marvel Cave, and its tours 500 feet below ground, emerged a tourist attraction and that spawned the creation of Silver Dollar City, one of the largest theme parks in the U.S.
Silver Dollar City, which celebrated its 50th anniversary in 2010, in turn stimulated more tourist activity — initially country music venues. Now there’s 49 live theaters offering much more than country stuff. Soji Tabuchi has been a Branson fixture for over two decades with his family-style show in a theater that bears his name, and legendary crooner Andy Williams has his Moon River Theater that brings in other types of music than country. I especially enjoyed an evening at the Hamner Barber Theater, the showcase for magician Dave Hamner and his long-time partner, ventriloquist Jim Barber. Russian comedian Yakov Smirnoff is also a popular entertainment option. Missouri residents call this high-energy community in the heart of the Ozarks mountains “the Las Vegas of the Midwest,’’ and the Oscar-nominated movie “Winter’s Bone’’ was filmed there. Annual visitors numbered over 8 million annually in recent years thanks in part to its family-friendly economical options and its location. One-third of the U.S. population is less than a day’s drive away. As for evening dining, the Mediterranean-style Bleu Olive and Cantina Laredo, with its Spanish dishes, are good bets in the downtown area. On the outskirts are all the usual chain restaurants along with some more economical places with local flavor like Montana Mike’s, the Rowdy Beaver and MacFarlain’s, where unsuspecting diners might be victimized by a rising table that will add some spice to your meal. If shopping, live shows, golf, cave tours and dining options aren’t enough, Branson also has cruises and fishing along three lakes; a replica of the Titanic ship disaster (billed as the world’s largest museum attraction), plus museums spotlighting antique toys, dolls, autos, dinosaurs, butterflies and war veterans. There’s also five water parks, circus acts, three outlet malls and the beautiful lakes of Table Rock, Taneycomo and Bull Shoals. And more is still to come — especially for golfers. A new golf facility, Top of the Rock, will reportedly offer a nine-hole course designed by Jack Nicklaus, a practice range designed by Arnold Palmer and a putting course designed by Tom Watson.